I am a PhD candidate in the Warner Lab at Auburn University. I study developmental plasticity in reptiles; however, I was privileged to teach high school science for many years, and I'm still most passionate about science education. ​ Frederick Douglas said, "Once you learn to read, you will be forever free." I love this quote, but it assumes a person also knows how to reason. I fervently believe that science education is the best tool to teach logic, rhetoric, and debate. With this tool, we can open minds and lead people to intellectual freedom. This is the first (and necessary) step toward freedom, generally. I have been awarded a Harry Merriwether Fellowship. This fellowship was given to Auburn University by an anonymous donor in honor of Harry Merriwether, an outstanding graduate of this University in the Class of 1943. It provides a $2,000 stipend to 4 graduate students across Auburn University's graduate programs based on academic excellence and professional promise. In 2007, I found a strange color variant of Marbled salamander (Ambystoma opacum) at Big Cypress Tree State Park in West, TN. This species typically has white or gray saddles that run down the back and onto the tail (bottom photo at left); however, this specimen was lacking the saddles entirely (top photo at left). Only once before has such a finding been published (also from Tennessee). Given that this species of salamander is extremely common, well-studied, and has a vast range across the eastern United States, these variants must be extraordinarily rare. I am proud to say that my record of this unusual salamander is going to published in the next edition of the Tennessee Journal of Herpetology. This will be the 3rd volume of the journal. I am thrilled to make a contribution to the flagship journal of the Tennessee Herpetological Society during its early years of publication. Sarin ("Putter") Tiatragul and I, along with coauthors, have just had a manuscript accepted for publication in the Biological Journal of the Linnean Society: "Lizard nest environments differ between suburban and forest habitats". In this paper, we describe nesting conditions for anoles in two diverse habitats: a suburban area and an adjacent forest in south Florida. Due to the urban heat island effect, suburban nests were much warmer and thermally variable than nests in the forest. Additionally, nesting habitat appears much more prevalent in the forest; however, it is also much more homogeneous. Thus, females may have more locations to nest, but the diversity of those sites is limited. Due to the patchy landscape of suburbia, lizards have fewer locations to put eggs, but the micro-environmental conditions available for nesting are relatively diverse. I presented some of my thesis research at the annual meeting of the Tennessee Academy of Sciences. I was so lucky to be able to travel back to my home state for this conference. I met many wonderful people and am humbled to be awarded 1st place for a student paper presentation in zoology. There is no better day I can imagine than one spent wandering through a hardwood swamp looking for salamanders. I enjoy this more and more as I grow older, and the joy only increases when I get to do it with my two favorite people: Hazel and Gray. Today we found several marbled salamanders making their way to their breeding grounds in Tuskegee National Forest. I presented some of my thesis research at the annual meeting of the Tennessee Herpetological Society. The meeting was held at the beautiful Lichterman Nature Center in Memphis, TN. There were many excellent student talks, and I am grateful to be selected for the best oral presentation. All in all, it was a wonderful conference, and I was happy that my research finally took me back home to TN, if only for a weekend. My manuscript, "Seasonal shifts in reproduction depend on prey availability for an income breeder" has been accepted for publication in the journal Physiological and Biochemical Zoology. For many organisms that inhabit seasonal environments, the quality and/or quantity of offspring produced can change through the season. In this paper, we show that such seasonal shifts can be dependent on food resources. We maintained breeding pairs of brown anoles on different diets that varied with respect to caloric content. We carefully monitored growth and reproduction across the full length of a reproductive season. Some seasonal shifts in reproduction (e.g. a seasonal increase in egg size) were not observed when females were maintained on a low-calorie diet. This work shows how the evolution of life-history traits in seasonal environments can be constrained by local environmental factors. In the field this week with Dan, Jenna, Amelie, Andrew, and Amanda. I'm collecting lizards (brown anoles) for an upcoming lab project. 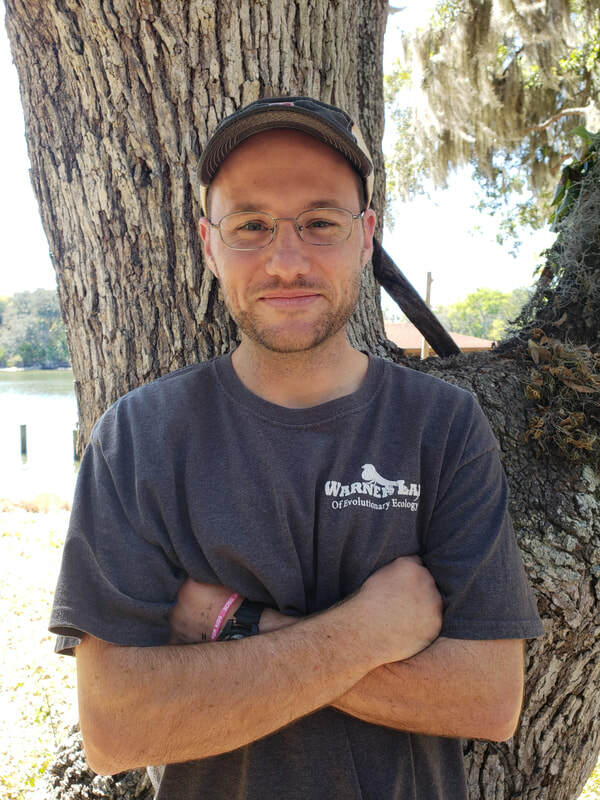 Jenna is working on excavating anole nests on small spoil islands in the intra-coastal waterway, and Andrew is exploring interactions between crabs and anoles on the islands (egg depredation). One of my dissertation chapters has been accepted for publication in the Journal of Experimental Biology: "Thermal spikes from the urban heat island increase mortality and alter physiology of lizard embryos". Urban habitats impose a multitude of novel selection pressures on wildlife. In this paper, we (Dan Warner and I) discuss the impact of the urban heat island effect on an oft overlooked life-stage - embryological development. We demonstrate that extreme ground temperatures in the urban heat island have the potential to increase egg mortality for lizards and alter basic physiological processes in embryos. I am the recipient of the 2018 Margaret McNeal Arant Memorial Award for Outstanding Achievement in Zoology. "This award recognizes a graduate student in zoology who demonstrates outstanding academic achievement, leadership qualities, and strong moral character." I am coauthor (with Tim Mitchell and Dan Warner) on a paper now accepted for publication in the journal Evolutionary Ecology: "Female investment in offspring size and number shifts seasonally in a lizard with single-egg clutches". In this paper, we demonstrate that reproduction of brown anoles shifts seasonally in ways predicted by life-history theory. We argue that brown anoles will make great models for learning about the evolution of reproductive strategies in seasonal environments. Read a short summary here. Putter, Jenna, and I attended the 2018 Anolis Symposium at Fairchild Botanical Gardens in Miami, Florida. Due to my incredible disdain for consumerism (and my "surly hatred of progress" - Ed Abbey), I take a crew of friends to Big Cypress Tree State Park every year on Black Friday. We spend 3-4 hours wandering wistfully through the swampy hardwood forest looking for cool cypress trees and salamanders. This year I was privileged to be in the company of my good friends Putter Tiatragul, Jordan Brasher, and my daughter Hazel. We found three of the four winter salamander species that inhabit the park (marbled, small-mouth, and mole). I faithfully take this yearly pilgrimage because I believe in a very simple truth: the world would be a better place if people cared more about cypress trees and salamanders than door-buster deals.